Will Peter Sagan conquer the Muur in the mini Tour of Flanders stage at the Eneco Tour? Peter Sagan paid the price for a relatively weak team and missed out on important bonus seconds on what turned out to be a surprisingly calm and perfect day for BMC in the Ardennes. The Americans can expect to come under more pressure in the final stage which is like a mini Tour of Flanders but even though rain is set to make the race a bit tougher, history shows that time gaps on the well-known circuit in the Flemish Ardennes are usually small and so Sagan may have to settle for a stage win while Rohan Dennis is in a great position to take his first overall win in a European WorldTour stage race. Nothing will be decided until the final day of the race as the organizers have saved the hardest road stage for the end. With the only uphill finish in the race, the final stage may even offer the best chance to create differences between the best riders after the two time trials. Naturally, the race has usually included a stage in the Flemish Ardennes but in 2012 the organizers decided to make it a lot harder by making it finish on the famous Muur van Geraardsbergen. When it was announced that the famous climb would no longer be part of the Tour of Flanders course, the city of Geraardsbergen made an agreement with the Eneco Tour which ensured that the stage race would include a stage on the wall in 2012, 2013 and 2014. In the first two years, the stage came on the final day but in 2014 it was held before the mini-Liege and mini-Amstel stages. Last year it was back at the tail end of the race and in 2016 it will again bring the curtain down on the race. The organizers haven’t changed much of what is now a classic in this race. At 197.8km, it is a bit longer than it has been in the last few years but it still doesn’t have the length of a classic. However, apart from the distance, it has all the ingredients of one of the major Flemish one-day races. The riders will tackle several famous hellingen in the Flemish Ardennes and as they go up some of them multiple times, numerous climbs are spread throughout the entire course. Like last year, the stage doesn’t start in Geraardsbergen. Instead, the riders will take off from Bornem from where they will travel south along flat roads. As they get closer to the Flemish Ardennes, the terrain will gradually become harder, with the first challenge being the Hurdumont climb (550m, 8%) after 92.8km of racing. The D’Houppe climb (1900m, 2.8%) comes just 1.8km later and then it’s time for the famous Tenbosse (500m, 7%) at the 103.7km mark. The riders will now be travelling in a westerly direction straight towards the most famous climbs in Flanders. After 112.5km of racing, the riders will hit the well-known 25.6km finishing circuit which has been used every year since 2012. First they will do the final 8.5km which means that they will tackle the Denderoordberg (700m, 8%) before they descend to the bottom of the Muur (1100m, 8.7%). The finish line comes 600m up the climb and signals the start of the final three laps of the 25.6km finishing circuit. The circuit is a very tough affair with no less than 4 climbs. Having descended from the Muur, the riders go straight up the famous Bosberg (1000m, 6%) which is another climb no longer featuring on the Ronde course. It is followed by the easiest section of the circuit before the riders will hit the Onkerzelestraat (1500m, 3%). At the top, there are still 11.2km to go, with the first part made up of a descent before the riders again reach the final section with the Denderoordberg and the Muur whose first 600m lead directly to the finish at the end of the third lap. The riders do two right-hand turns just after the flamme rouge before heading onto the climb where there’s a left-hand turn just 200m from the line. The golden kilometre starts halfway up the Bosberg on the final lap when 20.8km still remain while the first Primus sprint comes at the top of the Muur 500m after the first passage of the line and the second one comes at the same place at the end of the first lap. As said, the tricky finishing circuit has been used for the final stage of the 2012 and 2013 editions of the race, in stage 5 of the 2014 race and on the final stage last year and so it is now well-known by most of the riders. In the first edition, the peloton exploded to pieces on the Muur and in the end, Alessandro Ballan and Lars Boom emerged as the strongest. While the Italian took a rare victory on the famous Muur, the Dutchman gained enough time on then race leader Svein Tuft to win the race overall. In 2013, Zdenek Stybar took the jersey off Tom Dumoulin’s shoulders by finishing off a perfect display of team tactics. After Sylvain Chavanel had put the rivals under pressure, Stybar launched his own attack on the final lap to bridge the gap to lone escapee Ian Stannard. Accelerating hard from the bottom of the Muur, the Czech dropped his companion and soloed across the line to take both the stage and the overall victory. In 2014 it was Greg Van Avermaet who made the difference as he accelerated hard to fly past a fighting Pavel Brutt who had attacked a little earlier. He put one second into Tom Dumoulin, Brutt, Matti Breschel and Lars Boom which allowed Dumoulin to take the leader’s jersey off Boom’s shoulders by virtue of bonus seconds. Last year the early break made it and it was Manuel Quinziato who dropped Bjorn Leukemans to take the win. When the peloton arrived, Greg Van Avermaet beat Julian Alaphilippe and Tiesj Benoot in the uphill sprint as small gaps were created. Nonetheless, 19 riders finished within four seconds of the Olympic champion. After six days in great weather, things could change for the final day and turn it into a real Tour of Flanders. After a sunny start to the stage, rain is forecasted for the finale and the race is likely to finish in wet conditions. The temperature will be 23 degrees at the start but will soon go down when the rain sets in. There will be a light wind from a southerly direction which will gradually change. In the end, the light breeze will be coming from the west. This means that the riders will have a headwind almost all day until they get to the circuit. Here they will have a tailwind in the first part and then a headwind. It will be a crosswind on the penultimate climb and then a cross-tailwind and a cross-headwind in the run-in to the Muur. There will be a tailwind on the climb. Stage 6 was expected to produce some fireworks but the stage ended as a huge disappointment. It seemed that everyone realized that the climbs came too far from the finish to play a major role and everyone was preferred to save energy for tomorrow. Etixx-QuickStep never made the attacks that we had predicted and as the sprint teams were all a bit uncertain about their ability to handle the climbs, it became a steady ride between the BMC train for most of the day. The big loser was Peter Sagan and he could hardly hide his frustration when he was interviewed after the stage. As it has happened so many times in the past, he missed out on a big opportunity due to a poor team. Matteo Tosatto did some early work and Pavel Brutt, Maciej Bodnar and Michael Valgren chased in the finale. However, the team missed the firepower to make any contribution in the final 10km and Sagan lost the chance to sprint for the bonus seconds. The team had already realized that they were not strong enough to bring things together for the Golden Kilometre and in the end they left empty-handed. Sagan is still 27 seconds behind Dennis and now it will be virtually impossible to win the race. As we said yesterday, he is very unlikely to drop the Australian even though the race leader doesn’t have much experience in this terrain. Even if he wins the stage and picks up 9 bonus seconds in the intermediate sprints, he still needs to gain 8 seconds on the Muur. Of course there will be splits and Dennis may lose a few seconds but it is hard to imagine that he will lose that much time, especially as he is surrounded by one of the best classics teams. 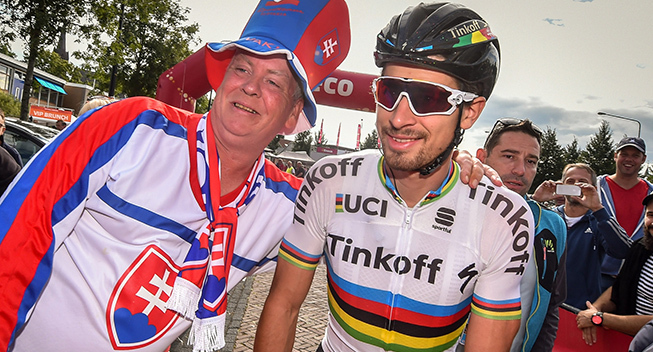 It will be interesting to see what kind of approach Sagan will have to the final stage. Will he go all out for the overall win with a big attack from the distance which means that he may miss out on bonus seconds and fail to get onto the podium? Or will he ride safely with a focus on the stage and a chance to move into second overall? The wise decision will probably be to go for the stage win as an all-out attack is unlikely to work out. The stage may be held in classics terrain and have a pretty tough finale but due to the shorter distance, it is of course not as selective as the Tour of Flanders. In 2013, 31 riders finished within a minute of the stage winner while in 2012 47 riders managed to reduce their time loss to less than 60 seconds. In 2014, no less than 32 riders finished within 6 seconds of Van Avermaet while 41 riders limited their losses to less than a minute. The gaps were equally small last year and it is very unlikely that Sagan will be able to create a decisive difference. With a strong BMC team to chase him down, it is hard to imagine that he will be able to claim a solo win even though Zdenek Stybar showed how it can be done when he turned things around with his big attack three years ago. In any case, Tinkoff will have to ride a conservative race as they don’t have the team to control things and they will have to take a back seat in the first part of the stage. Unlike in the first stages, we can’t imagine that it won’t be a very aggressive start – especially as the break made it in today’s stage and in last year’s edition of this stage. Most teams want a rider in the break so we expect a fast start. BMC have Greg Van Avermaet for the stage win but their main goal is the overall win. Hence, they will happily let the break stay away and they hope that there won’t be any dangerous riders in the early move. Ideally, there will be a non-dangerous Etixx-QuickStep rider there as that would mean that the Belgian team will take a back seat and if that’s the case, the break could very well make it. When the break has gone clear, BMC will control things and if they don’t get any help, the break has a chance like they had today. However, Tinkoff must be eager to chase a bit earlier than they did today and the stage must also be a big goal for Etixx-QuickStep. Even teams like Lotto Soudal, Giant-Alpecin and Dimension Data may have their eyes on a stage win so there should be some interest in bringing the break back. When we get to the circuit, the roads are likely to be wet and this will make things very nervous and stressful. The battle for position will be enough to reduce the gap significantly so we expect it to come back together pretty early. Then the final three laps will probably be a festival of attacks where BMC carefully have to decide which riders to let go and which riders to bring back. Ideally, a few riders will make it to the finish with a small advantage like it happened today as it will take away the bonus seconds. We expect riders like Tony Martin, Niki Terpstra, Bob Jungels, Zdenek Stybar, Lars Boom, Andriy Grivko, Wilco Kelderman, Tiesj Benoot, Tim Wellens and Tom Dumoulin to attack on the circuit and there is a pretty good chance that a small group will make it. BMC are strong enough to make sure that the most dangerous riders don’t get away but Tinkoff won’t be able to bring everything back. If the Russian team don’t get any help from teams that have missed the break, a late attack can pay off. Nonetheless, the most likely outcome is still an uphill sprint on the Muur. After all, there are several riders that are strong in this kind of finish and some key teams will always have missed the break. With the intense fight on the narrow roads, the pace will be fast and it will be hard to stay away. If it comes down to an uphill sprint, Peter Sagan is our favourite – at least if he doesn’t waste too much energy with an all-out attack from the distance. If he decides to focus on the stage win and a chance to move into second overall, he should be the best on the Muur. In this race, he has shown that he is great form and usually no one can match him on a 600m cobbled climb – just remember how he powered to victory in last year’s World Championships. The big challenge for him will be the fact that Greg Van Avermaet will be glued to his wheel throughout the entire stage and with a poor team at his side, he may have to close gaps in the finale. That could cost too much energy and Van Avermaet has proved that Sagan doesn’t have to fade much for the Belgian to beat him. However, if Sagan can stay fresh in the finale, he should win this stage. His big rival will be Greg Van Avermaet. The Belgian is one of the best in the world on the cobbled hellingen. He may not be quite as explosive as Sagan but he is not far off. The Muur suits him pretty well as he has proved in the last two years as he has been the best of the favourites every time. At last year’s and at this year’s Omloop, Tirreno and GP Montreal he has proved that he can beat Sagan in an uphill sprint and as the Muur is a lot steeper, he has an even better chance here. Furthermore, Van Avermaet has the advantage that he will be asked to stay on Sagan’s wheel all day and he is likely to be fresher at the finish. On the other hand, he may have to do some work if BMC are under pressure in the finale and this could take him out of contention for the stage win. If it comes down to a sprint on the Muur, we will be very surprised if the winner is not Sagan or Van Avermaet. Hence, most of our remaining picks will be riders that can go on the attack. One of them is Zdenek Stybar who is a former winner of this stage. The Czech has proved that he is one of the very best on the cobbled hellingen and as he lost quite a bit of time in the time trial, he is not an immediate danger to BMC. He seemed to come out of the Vuelta in good form and there is little doubt that he would love to finally get a chance to benefit from his condition. Etixx-QuickStep’s main goal is to win the stage and their best chance is to send Stybar on the attack. If he joins the right group, he will be hard to beat in an uphill sprint on the Muur. The same goes for Tiesj Benoot who has lost even more time in GC and so will have even more freedom. The Belgian was in great form in July but a bout of illness set him back. Hence, he has not been at his best recently but his form has not been too bad. He is likely to have become much stronger during the week and this is the terrain that he really loves. He is one of the best in wet conditions and on short, cobbled climbs and he has the sprint to finish it off. It’s a bit difficult to find out what kind of form Edvald Boasson Hagen has. He has done some good sprints but his time trial was very poor. However, he is now so far down on GC that he will be given the freedom to attack. He may choose to wait for a sprint but that would be a bad idea as he is never going to beat Sagan. He has always been strong in this terrain so if he opts to go on the attack, he should be one of the bet on the Muur. If it comes down to a battle on the Muur, there’s probably only one rider that can potentially beat Sagan and Van Avermaet. John Degenkolb has proved that he is one of the best in the world when it comes to the cobbled classics and even though he has had more success in Paris-Roubaix than the Flemish classics, he has been up there in these races too. He is not as explosive on the cobbles as Van Avermaet and Sagan and he has mostly just been hanging onto the best on the Flemish hellingen. However, on paper, he should be able to do a very good sprint on the Muur. Etixx-QuickStep have numerous cards to play. One of them is Matteo Trentin. The Italian has not had many results in the cobbled classics but he has actually been riding very well on the cobbles. He has shown great form recently and as he has lost time, he has freedom to attack on the final circuit. He is powerful in an uphill sprint so he can finish it off from a breakaway. Jasper Stuyven is one of the future stars of the cobbled classics and he is in great form. He did really well in Canada and he put in a strong attack on stage four. His potential in these races is unlimited and as he is far down on GC, he has freedom to move. He both has the power to attack and finish it off in the sprint. His teammate Fabio Felline is another solid contender. The Italian hasn’t raced much on the cobbles but last year he did pretty well in this stage. He has been riding hard in the Vuelta but the time trial showed that he is not too tired yet. Obviously he is strong on short climbs and fast in a sprint. Oliver Naesen is enjoying a breakthrough. He won the Bretagne Classic with a fantastic attack and he made a very strong attack in the finale of GP Quebec. He is made for the cobbled classics and it is just a matter of time before he delivers a great result in the Flemish races. He is strong on short climbs and fast in an uphill sprint so he can finish a late attack off. On paper, Las Boom is one of the best riders in this terrain but it’s hard to tell how he is going. He doesn’t seem to be at his best and he also seems to lack a bit of motivation. On the other hand, he must be inspired by a stage that he has won in the past and he has lost enough time to be given some freedom. A few years ago, André Greipel went on the attack in this stage and we won’t be surprised if he does so again. It’s important for him to show his good form ahead of the Worlds and as he won’t be competitive in a sprint, he will be forced to ride aggressively. That kind of approach has seen him finish in the top 15 at the Tour of Flanders and he is much stronger in this terrain than many think. Alexander Kristoff is a former Tour of Flanders winner but the Muur is too steep for him to be competitive in a sprint. However, he is still brutally strong in this terrain so we won’t be surprised if he goes on the attack. The Norwegian showed an aggressive approach and great form in the Tour des Fjords so if he makes it into a group in the final, his brute force will probably make him the strongest rider. Cannondale have two in-form riders: Alberto Bettiol and Dylan Van Baarle. Bettiol was second in Bretagne Classic and one of the best in the Canadian classics. Van Baarle was climbing better than ever in the Tour of Britian and has great experience on the cobbles. Both have the form and speed to win this stage from a breakaway. Finally, we will point to Tom Dumoulin. The Dutchman is clearly not in his best form but you can never rule him out. He has been close to victory in this stage in the past and he has the power to do well on the cobbles. He is both very strong in this terrain and very fast in an uphill sprint and with his time loss, he has lost enough time to be given some freedom.